The days when a residential or commercial solar installer did not need to know the difference in performance between lead-acid and lithium-based batteries are over. Battery storage has emerged as an unavoidable complement to solar, slashing peak charges and outwitting utility time-of-use charge games, not to mention saving microgrids from outages. Recommending battery chemistry to a customer is no less complicated than recommending a particular solar array solution. Depending on customer goals of low initial cost, ease of maintenance, frequency of use, depth of discharge, source of recharge energy, longevity and warranty, however, choices narrow down rapidly. Lowest life-cycle cost, or total cost of ownership calculations, performed for site-specific use, also help customers understand the variations in side-by-side options. Lead-acid battery solutions are far from antiquated, still capturing over a third of the global battery market. While it is true that lead-acid batteries are heavier than alternatives, charge more slowly and generate hydrogen gas as they age, lead-acid still provides a solid value at a low cost, and can disprove criticism of poor longevity in some configurations. Deep-cycle lead-acid batteries can last as long as a solar array, with designed use. Trojan Battery recently branded a line of batteries specifically for the solar industry to prove this point. At the high end, Trojan’s Industrial grade lead-acid batteries can last up to 17 years, delivering 3,600 charge/discharge cycles at an average 50 percent depth of discharge (DOD). In comparison, Trojan’s solar absorbed glass mat (AGM) lead-acid battery lasts eight years, delivering 1,700 cycles at a 50 percent DOD. You need to consider how much your customer wants to participate in the storage process. Less-expensive flooded lead-acid batteries — costing from $100/kWh to $200/kWh — provide between 600 and 1,200 cycles and require water refilling maintenance, but AGM or gel chemistry lead-acid batteries, which are 20 percent more expensive, can provide about 1,700 cycles without requiring the extra maintenance, according to Erguen Oezcan, senior sales director for renewable energy at Trojan Battery. The safety and environmental story of lead-acid is tricky. On the one hand, flooded batteries carry the extra costs of a venting system needed to draw off the hydrogen gas that is formed over time as well as a containment basin to guard against spills (a code requirement). But, on the plus-side, lead-acid batteries are 99 percent recycled — one of the most recycled products in industry today. Lithium batteries are not yet recyclable. There are some relatively new additions to basic lead-acid chemistry to consider. Carbon-enhanced anodes limit the formation of sulfate deposits, which hamper performance and decrease battery life. Other innovations include the use of metallic agents to enhance the electrolyte, layered insulating wrappings for AGM mesh and so-called moss shields that limit internal shorts. JLM Energy recently installed more than a dozen residential Phazr MicroStorage plus solar projects in locations throughout the greater Phoenix metropolitan area to shave peaks when demand spikes. When lithium-ion batteries came into common use, they seemed destined to capture the bulk of the battery market. But high prices — which thankfully are falling rapidly — combined with fire concerns have encouraged manufacturers to experiment with a variety of other lithium chemistry variations. One that’s emerging is lithium-iron phosphate (LiFePO4 or LFP), which exhibits fast discharge, long life and greater operating safety than other variations. LFP is a nontoxic, thermally stable material and is much safer — from fires and explosions — than the standard cobalt-containing lithium-ion (LiCoO2) chemistry. The difference in chemistry also makes the LFP less expensive than the lithium-ion battery. The cost of LFP batteries is down to about $400 per MWh and should drop further as more large-scale production comes onto the market. “LFP battery costs have dropped 25 to 30 percent over the last two years,” says Catherine Von Burg, the CEO of SimpliPhi. Still, commercial and industrial customers are seeing a return on investment for LFP in four years or less, when targeting problems like peak shaving, says Von Burg. Her company routinely installs LFP battery banks on C&I rooftops. A host of local regulations have arisen to mitigate the fire risk from lithium-ion, which adds cost to both residential and commercial applications installed indoors. This is where LFP’s chemistry can make a difference — at the point of installation completion. LFP performance can beat lithium-ion, with LFP batteries generally providing about 2,000 charge/discharge cycles, compared to about 1,000 for lithium-ion batteries, according to one industry source. Because of its safety, rooftop battery solution provider JLM Energy also uses LFP in its Phazr battery system, which is mounted underneath each panel in a rooftop solar array. 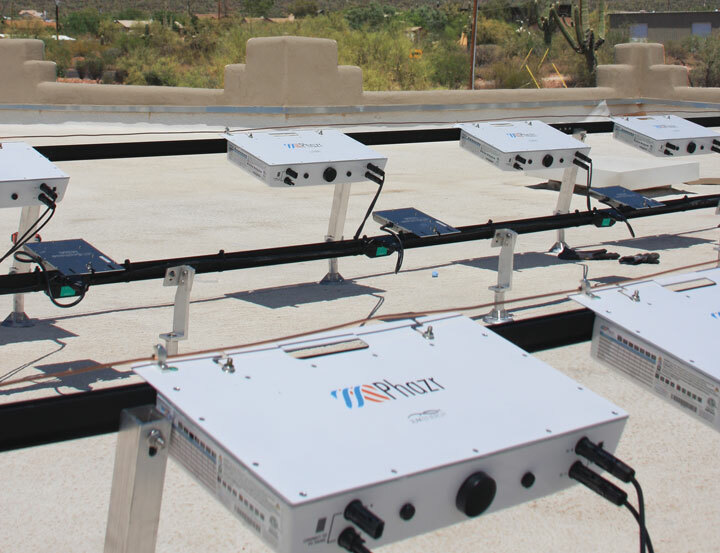 One forward-looking advantage of using LFP battery systems is the growth of community solar, microgrids and other aggregated forms of distributed energy resources. As utilities become more capable of interacting with these DER systems, more smart, fast battery systems will be called upon to support the grid, if not also enabling some form of private-sector energy arbitrage, suggests Von Burg. Comparing battery lifetime has become more standardized with the advent of the International Electrotechnical Commission’s (IEC) standard 61427 test, which provides performance criteria that all batteries for PV applications should be measured against. It offers a common, internationally accepted platform to compare and contrast batteries from different manufacturers. Warranties are also widely variable, so trust in solid companies unless a reliable third-party warranty policy has been issued on the product. “There is a trend among battery companies with a limited reputation to give unbelievable warranty terms. Then the owner has to prove a lot of things to collect on the warranty, which is really tricky and in-transparent,” Oezcan says. To aid in the information battle, independent energy certification body DNV GL just developed Battery XT, the first testing-based verification of battery lifetime for lithium-ion batteries. The independent verification tool compiles battery lifecycle data and predicts battery degradation under different conditions and duty cycles, providing renewables stakeholders with an objective way to compare the value and reliability of types and brands of energy storage technology as well as provide consulting on battery size and chemistry selection. This section was featured in the January/February 2018 issue of Solar Builder magazine. Sign up for a FREE subscription here. $400/mWh or $400/kWh for LPH?